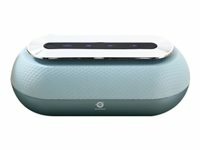 The Conceptronic DUNKAN is a Bluetooth multimedia speaker which connects to any Bluetooth phone, tablet, or laptop. With its convenient touch control function, easy full speaker control by fingertips, the DUNKAN offers superb music listening and a streamlined navigation experience. Stylish and simple design that fits any room in your house, with high quality and great stereo sounds that brings music to life.